If you are looking for a family holiday under more tropical skies than the usual haunts of southern Europe, let me point you in the direction of Jamaica. A country of calypso colours, chilling and constant carnival atmosphere. The most popular destination is Montego Bay and its glistening white beaches, unlimited palm trees and bright blue seas stretch for infinity. 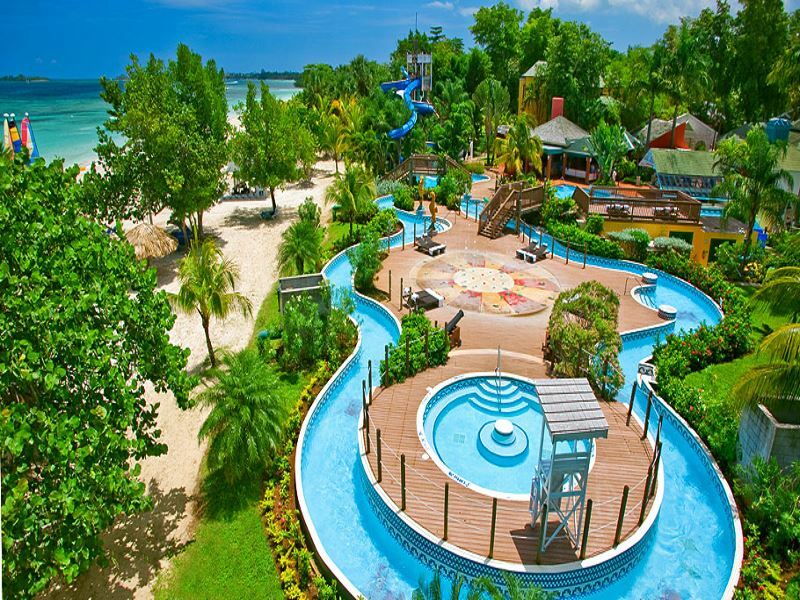 There are more than twenty all-inclusive resorts that cater for families of all ages, alongside a plethora of more traditional hotels offering everything from self-catering to full board. The big resort hotels all have private beaches for guests, kids clubs and all day activities for those inspired to do more than laze by the pool. Volleyball, golf, aqua aerobics, football and beach cricket are the favourites but everything from sandcastle competitions to cocktail classes are offered. I stayed in The Ritz Carlton Rose Hall which, like most of its competitors, has a selection of in-house restaurants including an a la carte option (book ahead and bring trousers for the children) with transport to and from via horse drawn carriage. However, the main draw of Montego Bay is not the strip of picture perfect palaces masquerading as hotels, but its proximity to places that give you a snapshot of real island life. Jamaican culture has a strong global presence with world famous exports like reggae, ska and jerk chicken. Their fiery brand of cuisine has spread to all corners of the planet and is as famous as Red Stripe beer or Bob Marley. Under an hour’s drive away sits the quaint Sherwood Content, the hometown of Jamaica’s other best known export; Usain Bolt. Here, you can visit the first track he ever sprinted down, sample traditional street cooking and even meet Mr. Bolt senior who still runs the village shop. A short drive along the coast separates Montego Bay and Oracabessa, the home of James Bond beach. This is where Ursula Andress’ infamous ‘coming out of the water’ scene in Dr. No was shot. A slice of cinema history which both father and son can enjoy, perhaps for different reasons. The Caribbean’s tropical climate is also responsible for some spectacular wildlife and nature. The Montego Bay Marine Park boasts an extensive selection of ocean phenomena, including stingrays and sharks. However, if you plan on leaving your hotel just once, then make the twenty minute drive to the sparkling waters of the Luminous Lagoon. It is home to millions of microorganisms called dinoflagellates that produce an eerie glow when disturbed, illuminating the fish and bodies in the water, lending the surroundings a distinctly extraterrestrial feel. Tours are led by the charismatic Jerry who boasts to have ‘never lost a client in this water’. I’d hope so too. The other main resort of Ocho Rios is perhaps better suited to more adventurous families. It is home to the Dunn River Falls; a Jamaican national treasure. Older children can climb the waterfalls and those of any age can swim with dolphins. There’s also ziplining, river rafting and even bobsledding at Mystic Mountain for those who are fans of the cult classic Cool Runnings movie. All this and more leaves Jamaica beautifully equipped to fulfil and exceed all your expectations, except maybe one. Contrary to popular belief and stereotype, I wasn’t once offered marijuana during my stay.